Three Rooms Press, 9781941110560, 400pp. When Silas Fortunato applies for an editorial position for the "spirituality" section of a local newspaper, he is asked to fill in a bubble sheet to mark his religion. The problem is, his beliefs don't fall within any of the categories. Silas believes that selflessness enlarges vision and that what a person should strive for is to be overcome by the beyond. He believes in honoring otherness and in giving questions credence over certainty. He calls himself a Cosmoterian because his goal is to make himself worthy of the majesty of Cosmos. Silas is a man driven by big ideas, but it is the everyday smallness that perpetually both intrigues and eludes him. In this emotional tale of haunted love, Silas finds himself locked in a marriage descending toward darkness until the arrival of his sister-in-law and soon thereafter the appearance of a witching neighbor who may or may not be alive. In ways enigmatic, ghostly, and funny, the three women draw him into the equivocal nature of dreams and reality, their influences leading Silas on a journey toward what may be light and a new belonging to something vastly beyond himself. Just as William Least Heat-Moon's nonfiction employs many fictional narrative techniques, Celestial Mechanics draws upon nonfictional devices to build a story that crosses traditional boundaries between the two. 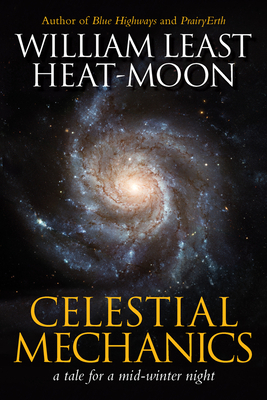 Celestial Mechanics is the clarion call of a generation that believes rationality and spirituality can--and should--coexist, a generation defined by globalization, where the only things left unknown are what is within and beyond us, those cosmic realms revealed by the telescope and the quantum world suggested by the microscope. This book is for those of us steeped in a hustle-and-bustle world we can't escape, who believe that practices like mindfulness and rational deduction and childlike wonder are the keys to the kind of fulfillment that the commercial aspects of our lives can never hope to address. WILLIAM LEAST HEAT-MOON, pen name of William Trogdon, is of English, Irish, and Osage ancestry. He lives in Missouri on an old tobacco farm he's returning to forest. His first book, Blue Highways, tells of a 13,000-mile journey around America on back roads. His second work, PrairyErth, is a narrative exploration into a corner of the great tallgrass prairie in eastern Kansas. River-Horse gives an account of his four-month sea-to-sea voyage across the United States on rivers, lakes, and canals. In Roads to Quoz, Heat-Moon sets out for a half-dozen American destinations that have long intrigued him. Here, There, Elsewhere brings together a collection of his short-form reportage about places around the world. His five major books and the recent Writing Blue Highways have never been out of print. Celestial Mechanics is his first novel.